What problem in level measurement will result from there being an occasional vapor pressure buildup inside this vessel? How may this problem be corrected so that the liquid level will be accurately measured at all times? Any vapor pressure will be sensed by the transmitter and interpreted as increased liquid level! Use two transmitters (one at top of vessel, one at bottom) and electronically subtract their output signals. Connect the “Low” side of the one ∆P transmitter to the top of the vessel to naturally compensate for vapor pressure. 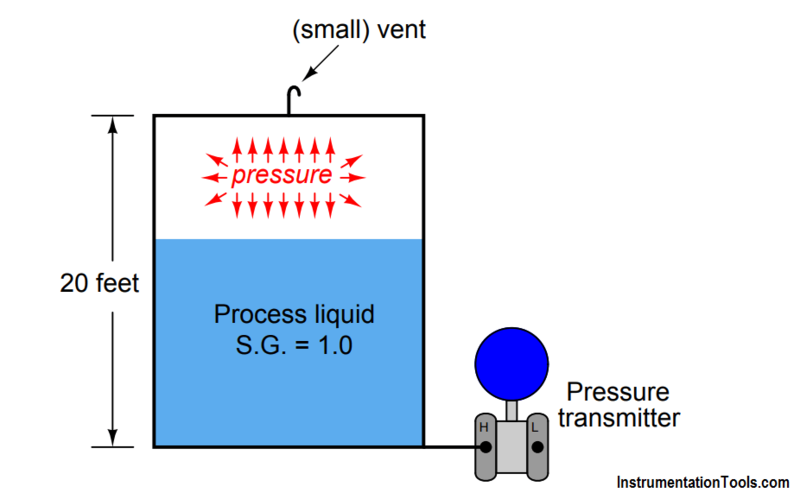 Since the transmitter infers level from the amount of pressure sensed at the bottom of the vessel, any vapor pressure buildup inside the vessel will be falsely interpreted as additional liquid level, since the transmitter senses the sum total of hydrostatic pressure plus any vapor pressure trapped inside the vessel. For example, if the process liquid level were at 10 feet (50% of range), the hydrostatic pressure generated by the liquid column would be 120 inches W.C., assuming a specific gravity of 1.0, equal to water. If, however, the vessel contained a vapor pressure equal to 15 inches W.C., this pressure would add with the 120 inches W.C. of pressure generated by liquid head to create 135 inches W.C. of total pressure sensed by the transmitter. As a result, the transmitter would “think” it was detecting a liquid level of 11.25 feet (135 inches high) instead of the true level of 10 feet (120 inches high). Essentially, any vapor pressure in the vessel results in a “zero” shift of the transmitter’s indication. In many applications, the gas pressure inside a vessel far exceeds the hydrostatic pressure generated by the column of liquid inside of it, so this problem can be a very serious one in level measurement. 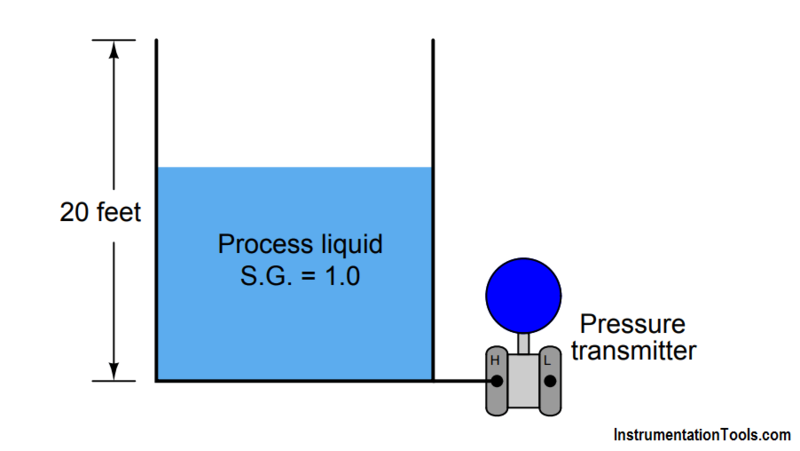 We need to fully understand the nature of the problem and how to solve it in order to successfully measure liquid level in many industrial applications. 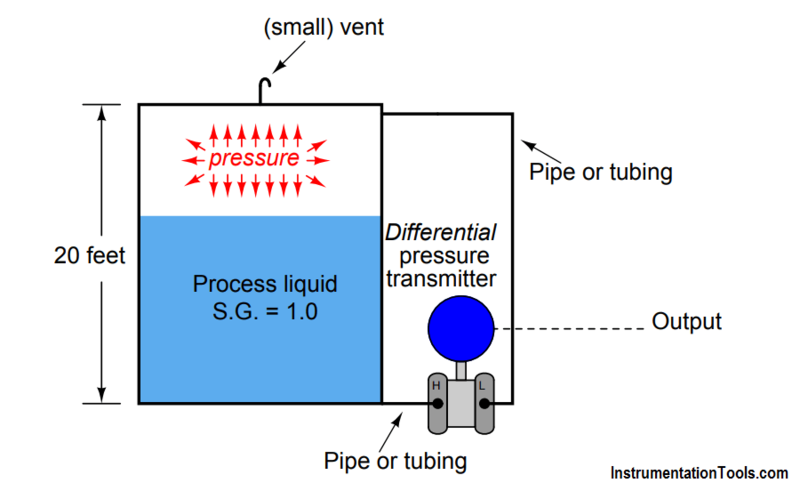 Because the differential pressure transmitter solution requires only one sensing instrument rather than two, and results in better accuracy because we are only dealing with the inaccuracies of a single instrument rather than the compounded inaccuracies of two instruments (three, if you include the subtraction unit), the differential, or “d/p” solution is the one more widely used. 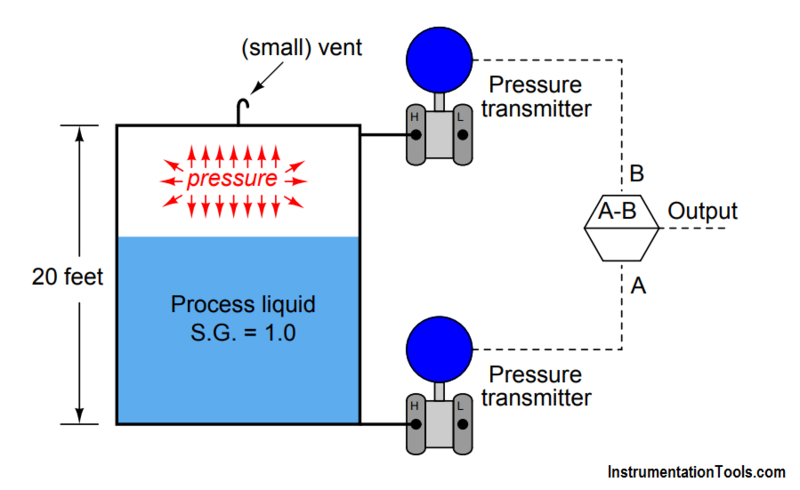 In this particular level measurement application, a differential pressure instrument would have the exact same calibration points (lower and upper range-values) as a “normal” pressure transmitter connected to an open vessel. In this article complete solution for closed tank using dp transmitter not elaborated clearly. The questions arises that for the explanation given above for dp transmitter what will be the calibration range?